Quiche Lorraine is a traditional quiche recipe and a favorite by many. 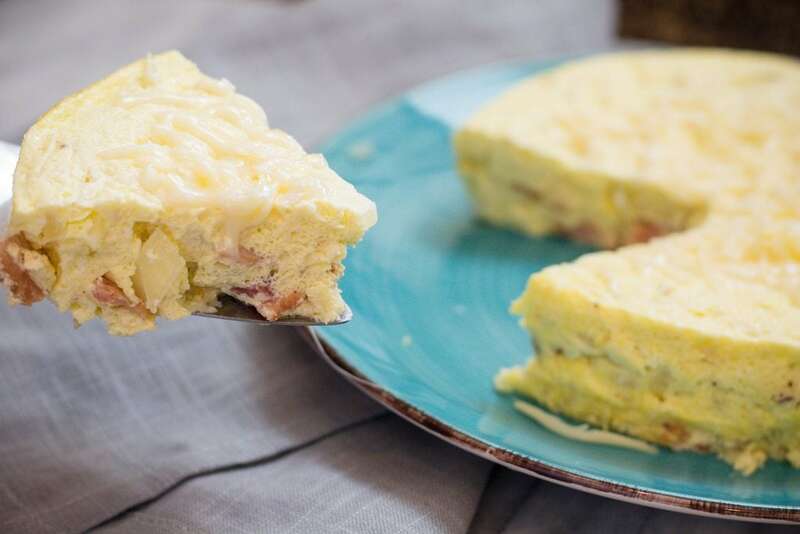 This crustless Quiche Lorraine Recipe is amazing and perfect for any meal. 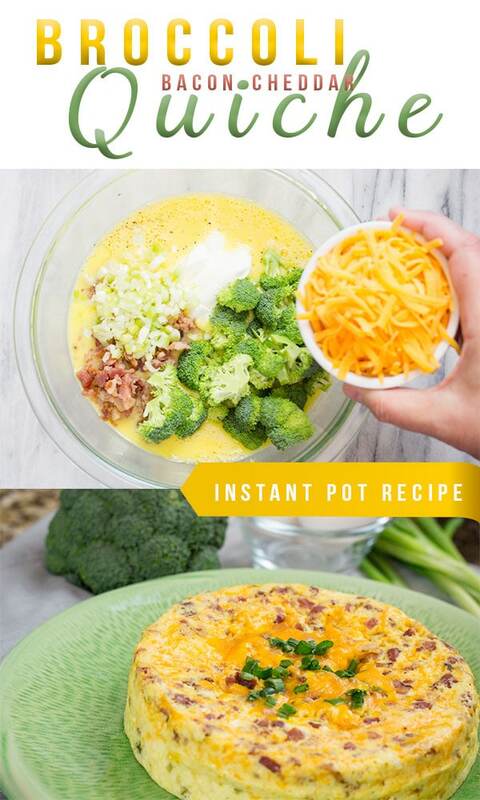 This recipe is also Keto friendly packed full of protein. I love quiche and all flavors of quiche. It just makes me feel good when I eat healthy. Quiche Lorraine is a famous recipe with bacon and Swiss cheese. 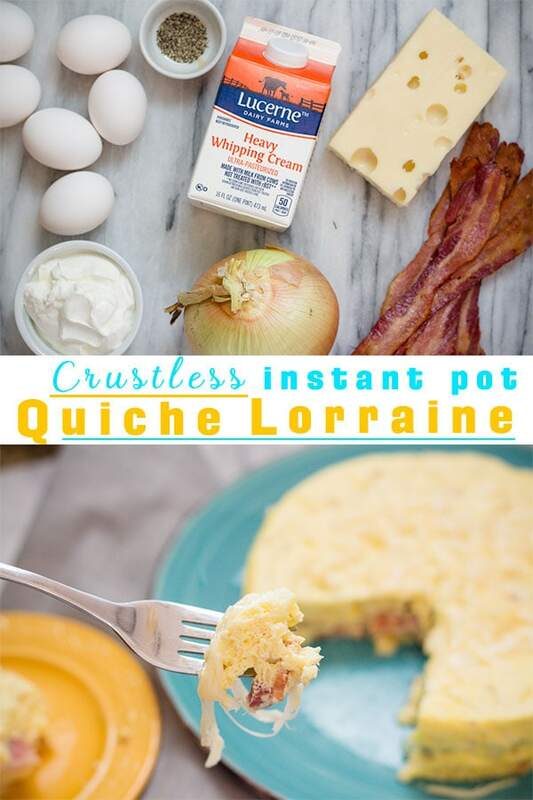 This crustless Quiche Lorraine is easily made in the Instant Pot Pressure Cooker and a perfect recipe for Breakfast, Brunch or even Dinner. Well the Simple answer is, a quiche withOUT a crust! Crustless Quiches can be made from any traditional quiche recipe. Removing the crust means less carbs and a more healthy option. We have a number of favorite quiche recipes including one with a crust! The Breakfast Quiche made with sausage and cranberry is a fun recipe and the balance of sweet and salty is perfect. 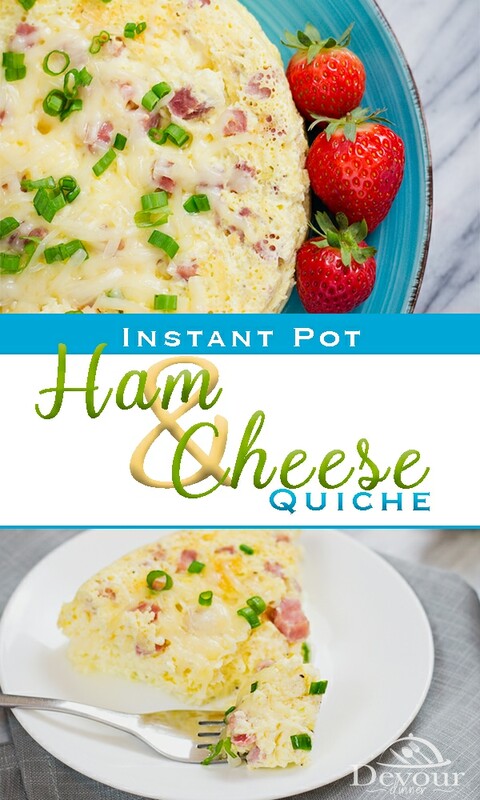 I do also really enjoy a more traditional Quiche Recipe of Ham and Cheese Quiche. This easy quiche recipe is thrown together quickly and perfect for any meal. 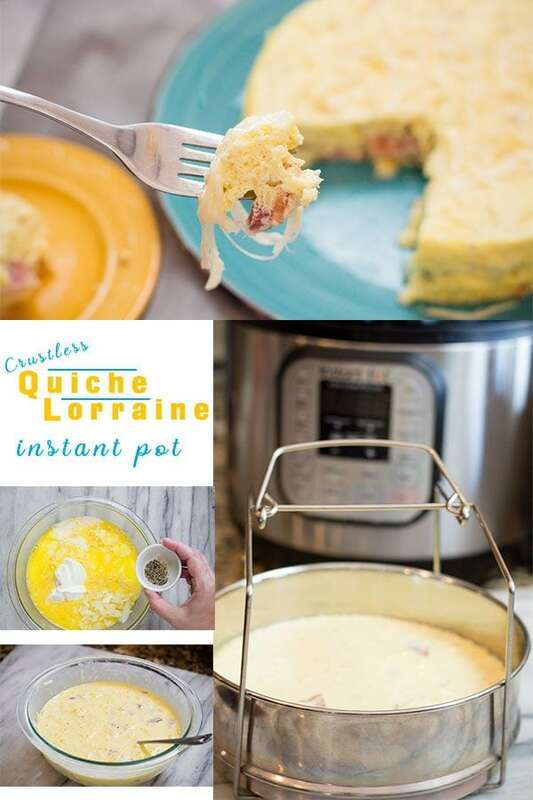 Is Quiche Lorraine Keto Friendly? Yes! Crustless Quiche Lorraine is Keto Friendly. But Keto or not, it’s delicious and we love it even re-heated the next day. Why is there water on my quiche? When can I serve Quiche? Quiche is wonderful for Breakfast or a Sunday Brunch. However, Quiche Recipes can also be served for Dinner. There is no bad time to serve quiche. 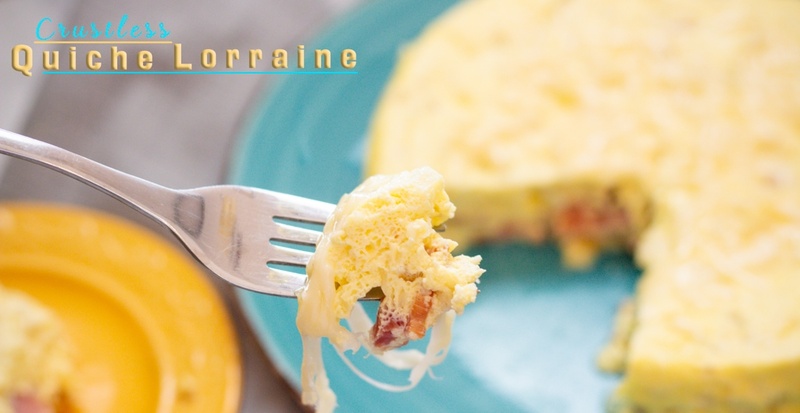 Quiche Lorraine Recipe is delicious with cooked bacon and Swiss cheese. I enjoy how light and fluffy this recipe is and still holds it shape when placed on a plate. Give this recipe a try and let me know how you like it. Run a knife around the edges of the baked quiche to losen the edges before you flip out the quiche onto a plate. Also wrap the bottom of a springform pan with foil to prevent any leaking. 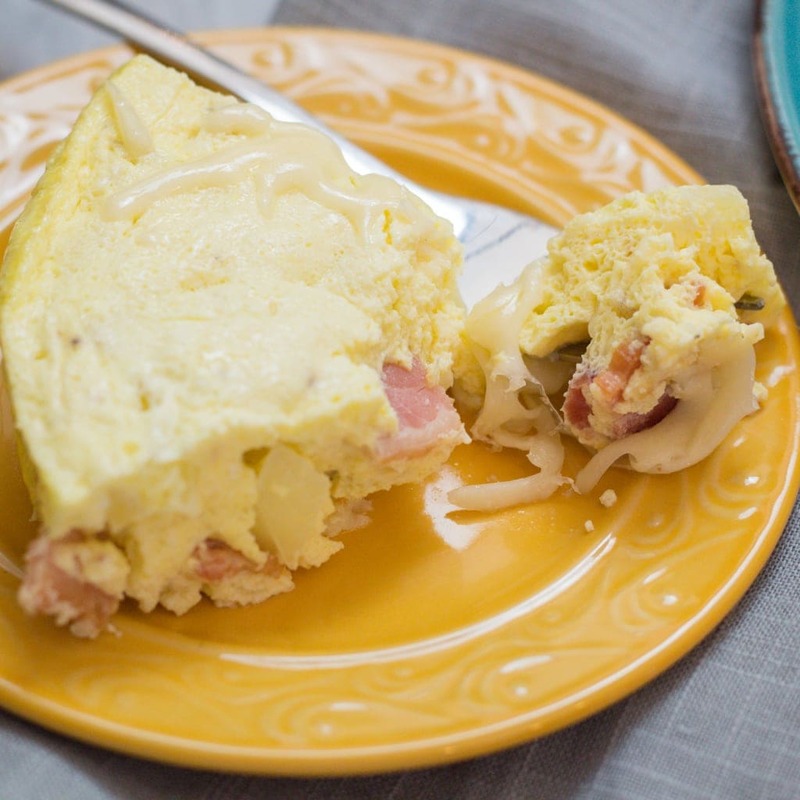 Crustless Quiche Lorraine is Keto Friendly and delicious. 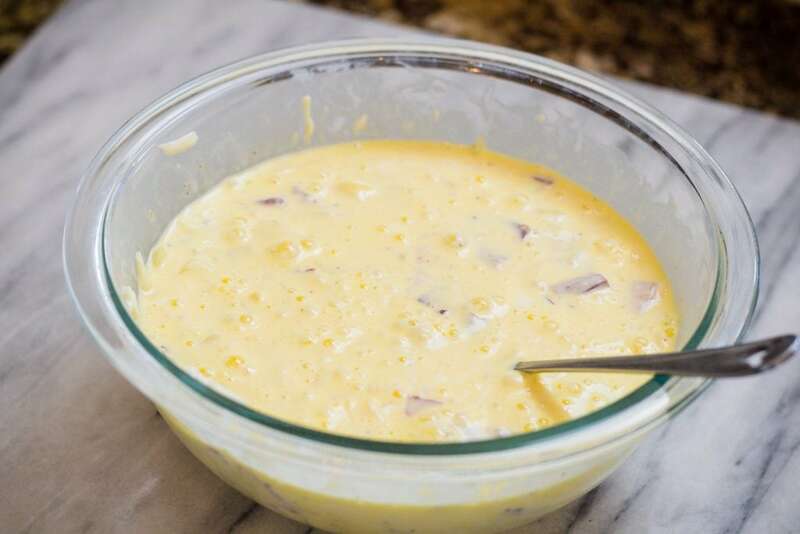 Don't let Keto scare you, this crustless quick is packed with flavor from Swiss Cheese to Bacon and of course Eggs that are light and fluffy. A favorite Quiche Recipe you will love. 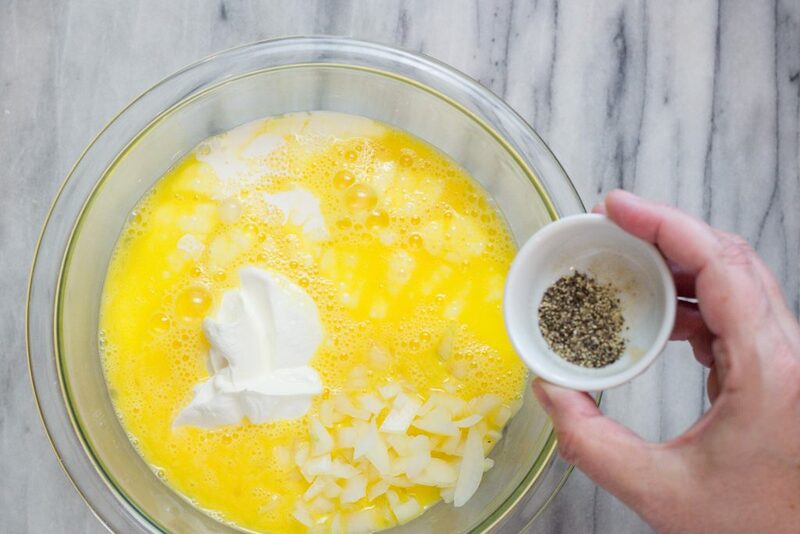 In a medium mixing bowl whisk eggs. 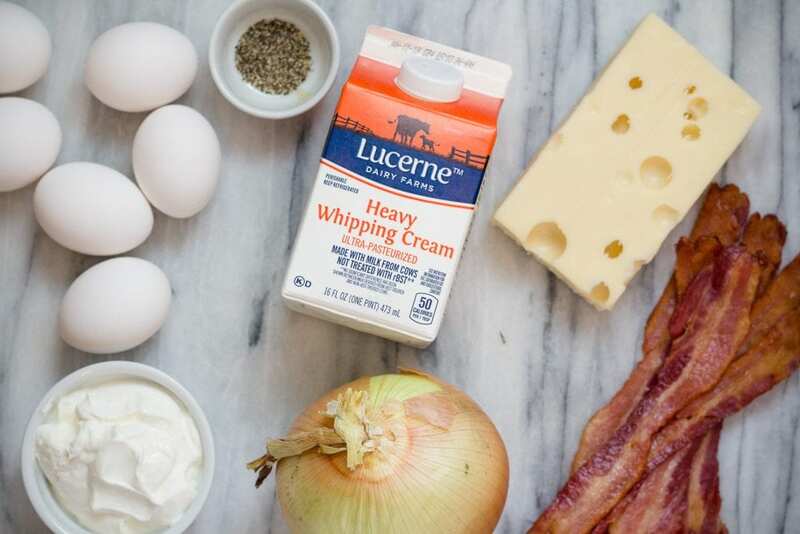 Add Sour Cream, Whipping Cream or Half and Half, Bacon, Cheese, Onion and Salt and Pepper. Stir to combine. 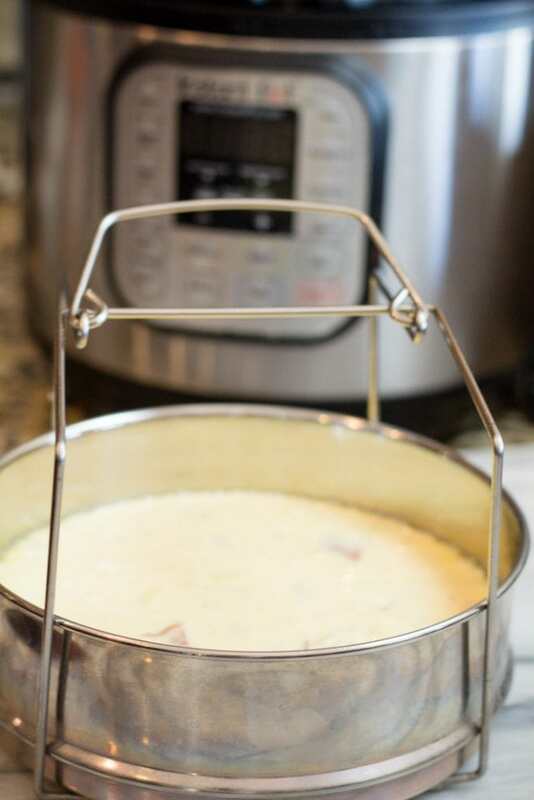 Pour quiche ingredients into a well greased pan that fits into your pressure cooker on a trivet. This could be a springform pan or a 2 tier pan. Add 1 1/2 cup water to the bottom of your pot. This is to build pressure. 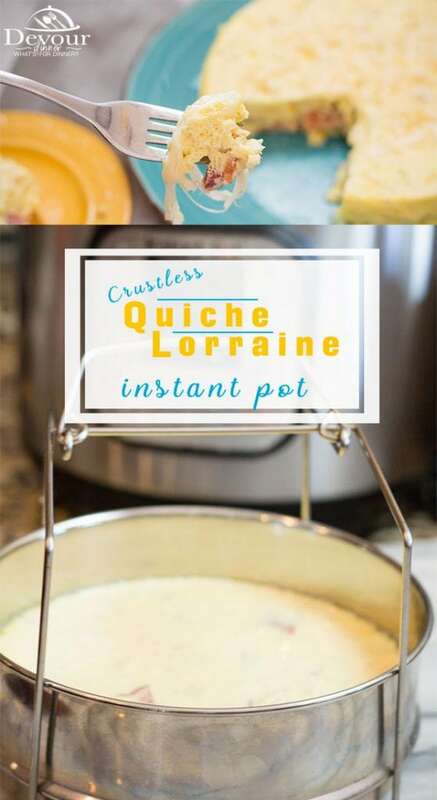 Place quiche inside of pot on a trivet. Close lid and set to Manual Pressure for 25 minutes. Quick Release Steam and remove quiche. Run a knife around the inside of the pan to loosen the edges of the quiche before turning out of the pan. Flip crustless quiche by placing a plate on top and inverting the quiche. 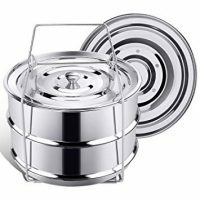 *Wrap your springform pan with foil to prevent leakage! Should you cover your pan or Pyrex with foil? I do not cover the pan. If you cover the pan I have found it takes a little bit longer to cook. The pan link goes to carpet tape.